The Laggan Wolftrax Centre was opened in April 2015 with the support of the Cairngorm National Park Authority (CNPA) and Forestry Commission Scotland (FCS) to provide permanent facilities for the established mountain biking trails. The Centre is owned and built on LFT land bought from FCS in 2007. The facility comprises public toilets and showers, a café, a bike shop and the LFT office. The Centre operates as a Social Enterprise run by The Laggan Forest Trust Forestry Company, LFT’s trading arm and only shareholder. 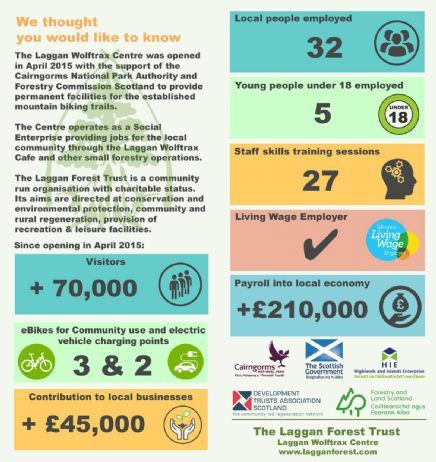 It provides employment for the local community through the Laggan Wolftrax Cafe and other small forestry operations. Since the centre was opened we have contributed more than £210,000 in payroll to the local community benefiting over 30 people. It is an ongoing challenge to make the centre sustainable and we are always dependent on your support when you use the café.